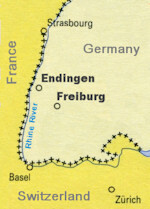 In his letters, Wilhelm referred to Endingen as Endingen-im-Breisgau, Grand Duchy of Baden. Today it is known as Endingen am Kaiserstuhl, in the Länder (state) of Baden-Württemberg, Germany. Wilhelm was born on 8 February, 1815, into a middle class family in Endingen. He was baptised Wilhelm Böniz the next day (9 Feb.) at the Sankt Petri-sankt Martin-katholisch church. The speed with which he was baptised suggests he may not have been exptected to live. Wilhelm’s parents had been married fifteen years when he was born and he was their sixth child. His father, Franz Antonius Böniz, born in Endingen in 1773, was forty-three years old; his mother, Maria Anna Wagner, born about 1778, was about thirty-seven years old. The family were coopers, a middle-class trade. Wilhelm’s father and grandfather (Thaddeus Böniz) were both master coopers (barrel or cask makers) in Endingen, as was Wilhelm’s older brother Thaddaeus. Casks and barrels were used into the early 20th century for storing many goods, particularly food, not just wine and beer. Background: (i) On the Benitz Family Roots - Endingen page we cover the following subjects: ‘Evolution of the family name’, ‘Family Religion’, ‘Endingen’, the ‘Social Structure of a Badische village’, and the trade & skills of a cooper. (ii) On the Benitz Family Roots - Böniz-Benitz Family Tree page we provide Wilhelm’s paternal ancestor tree. He is shown at level 4) (maroon) about 2/3 the way down the list. We have yet to research his maternal ancestors at each generation. Growing up in Endingen, Wilhelm most likely spoke Badischen, the German dialect of Baden. Per a letter he wrote to his older brother Thaddaeus (March 8, 1855), he was taught to read and write German by Mr. Grom. 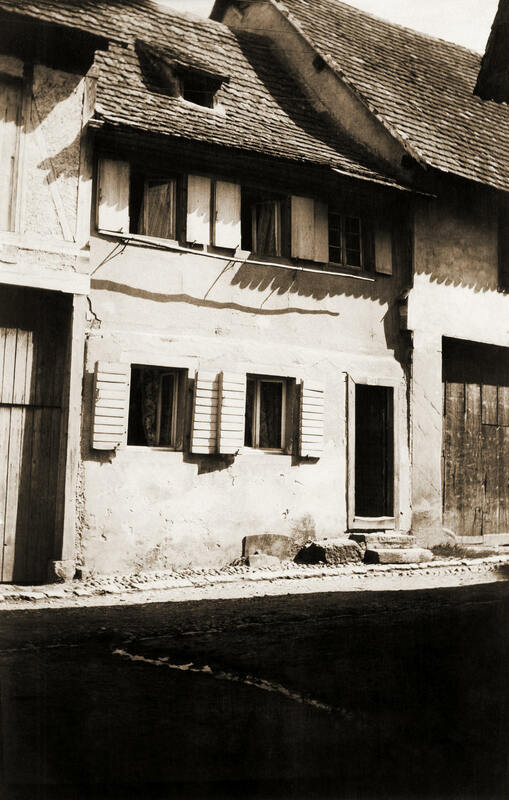 According to family legend he later attended the University of Freiburg, but given his social standing as the son of a tradesman, it is much more likely he was in Freiburg as an apprentice — possibly as a topographical draftsman. Quest. 4. Are you a professional surveyor? Ans. 4. I am not. I was [a] topographical draftsman, but never learned to survey. Wilhelm had drawn the original diseño included by Bartolomeo Bajorquez in his petition to the Mexican authorities in 1844 for Rancho Laguna de San Antonio. In the summary of the US court case, the diseño is described as “drawn with somewhat more than usual skill”. Apart from his schooling, we know nothing about Wilhelm’s childhood and youth in Endingen and Freiburg. We assume he was influenced by the current events and social conditions of the period, some of which undoubtably prompted him to leave in 1833, at age 18. We found the following tantalizing photographs in the personal collection of Wilhelm’s widow, Josephine Kolmer. They are 19th century cabinet cards, thin paper photos mounted on stiff cardboard, about 11x17 cm. (4.5x6.5 inches). We recognise the Alten Rathaus and the water fountain of Endingen, both there today. We do not know when or how Josephine came to have the photos. A relative could have sent them in response to Wilhelm’s request for photos, made in his letter of 22 Sept., 1856 to his brother Thaddaeus. 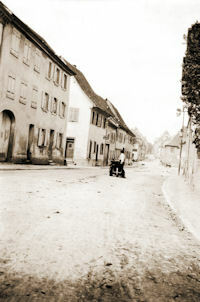 Another possibility is that Wilhelm and Josephine’s son Alfred obtained them when he visited Endingen during August, 1904. The quality and style of the photos suggests they were taken in the late 1800’s. Enlarge the street scene, and you will notice a gas street-lamp on the right. Enlarge the numbered house photo and you will notice at the top what appear to be four wires strung high along the street — what is their purpose: telegraph, telephone, electricity? If we knew, we could at least date-range the photos. 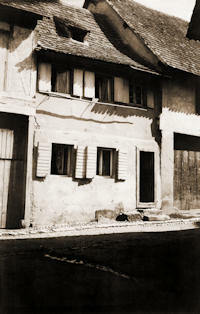 We also do not know the significance (if any) of the street scene and of the house with the numbered door. Why that street? Why that house? The number (501) is clearly readable on the transom above the door (when the picture is enlarged). Was it the family home? Which family: Benitz, Kolmer, Lederle? We simply do not know. 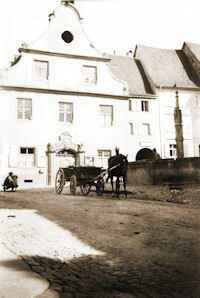 There is a note written in English on the back of the Alten Rathaus photo incorrectly labelling it as the Benitz home. However, the note was most likely made by one of Josephine’s granddaughters, none of whom ever visited Endingen. Having been told that one of the houses in this set of photos was the Benitz home, but not knowing which, the granddaughter (wholly in character) chose the most grandiose. If our suppositions are correct, then House #501 is by elimination the Benitz family home. We had the opportunity in 1999 to visit Wilhelm’s (and Josefa Kolmer’s!) birthplace. It is a very picturesque town surrounded by vineyards at the northern foot of the Kaiserstuhl hills, located northwest of Freiburg-im-Breisgau on the east side of the Rhine valley. We were attended to like visiting VIP’s by the town’s Bürgermeister, Herr Hans-Joachim Schwarz. The Benitz name is of great interest to the town due to Alexander Benitz, a cousin of Wilhelm’s. In 1842-1843, Alexander led a group of 400 emigrants, recruited from Endingen and the surrounding villages, to Venezuela where 65 km (40 miles) west of Caracas they established Colonia Tovar. A museum was being created in Endingen to commemorate the Tovar emigrants. The website for Endingen is: www.endingen.de The Alten Rathaus (see old photos above) appears in several pictures and can be seen center-right in the live Webcam of the town’s marktplatz.